A Pumpkin theme is perfect for a Fall / Autumn party! 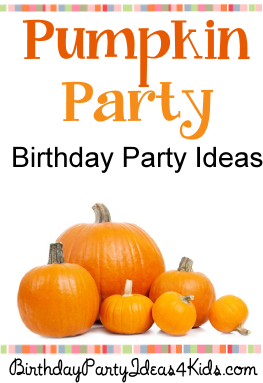 Party games, activities, crafts scavenger hunt and ideas for decorations, party favors and more are included in this page full of fun ideas. Line the kids up in a line next to each other. Give each player a small pumpkin and ask them to place it on their head. The first player to go from start, around a turnaround point (small orange cones work well ) and back to the start wins! If a player drops their pumpkin they have to go back to the start and begin again. Play several round and to make it harder have them do different rounds walking backwards, crawling, turning in circles etc. This is a fun and very messy game and should be played outside. This is played like the egg toss game only with pumpkin pies. Players pair up and each team is given a pumpkin pie. Teams line up and face each other about 5 feet apart. The first player tosses their pie to their partner. If the pie is caught then every team that caught a pie steps back 2 feet from their team mate. If a pie is not caught then that team is out. Play continues until the final team catches their pie from the farthest distance apart. Give each player a blown up orange balloon and a paper snow cone cup. Have them set the balloon on the cup so it balances. Then have them push the balloon into the air and try and catch it again with their cup. Players try to throw hula hoops around pumpkins. Total their points and determine a winner after 3 rounds. Divide into teams and give each team a medium size pumpkin and a broom. One by one they have to use the broom to sweep the pumpkin from the starting point, around the course and back to the start where they hand off the broom and pumpkin to the next player. The team that completes the course fist wins. The course can be an easy to and from a turnaround point or harder course that contains obstacles (over a ramp, through a tunnel, etc. ) for older children. Make a large Tic Tac Toe board on the ground using straw, hay, masking tape, etc. Take turns playing tic tac toe on the large board using the pumpkins as place markers. See if the white or orange pumpkin team wins! Paint point values on the pumpkins and set them up so that the larger point values are furthest away from the start. Players try to throw circular metal canning lids over the stems of the pumpkins. Players each get 5 turns. Add up the points and the highest score wins. Fill a clear plastic container with pumpkins. While you are filling the container count the candy and write down the total number in the jar. Seal the container. While guests are arriving to the party ask them to guess how many pieces of pumpkin candy are in the jar. Provide pencils and paper so they can write down their name and guess. At the end of the party read the guesses and see who is the closest to the number in the jar. Winner takes the jar home! Decorate with orange balloons, hay bales, fall leaves and mums. Pumpkins of all sizes on the mantle and party tables. Place pumpkins on candlestick holders, in large glass vases, stacked on top of each other all around the party area. Wooden crates or hay bales can be used to create height in arrangements. Have guests draw a design on their pumpkin and then have an adult use a drill to outline the design (leaving space in between holes). When a candle or flashlight is placed inside light will light up their design. Decorate orange t-shirts with fabric paint.